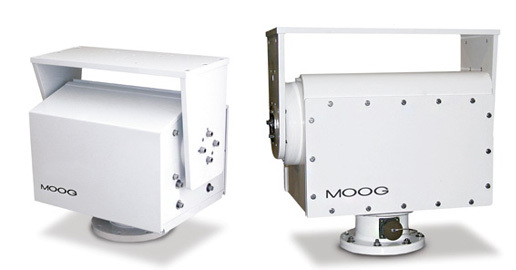 Moog solutions support cameras, dishes and antennas around the clock and around the globe. Rugged tripods and antenna positioning systems for mobile and fixed mount applications support broadcast and communications’ vehicles used for electronic news gathering, satellite, mobile cell site and video production applications. Moog surveillance and security products are also used at command centers and communications units for Homeland Security and other Federal, State and local law enforcement agencies. Moog positioners are proven reliable for demanding payload, wind load, transportation shock and vibration conditions. Broadcast positioners are available as stand-alone units, or as integrated custom systems. Analog pan and tilt positioner can handle payloads up to 50 lb-ft of torque. Analog driven or Digital Serial Integrated Controller (IC) models. Tough, durable, and rugged enough to handle virtually any environment. Payloads up to 500 ft-lbs (678 Nm). Auxilliary payload support (cameras, laser range finders, laser designator, GPS, etc.). Ultra stable, sturdy tripods for industrial, military and custom solutions.